1. Motor Driver (MTD), Grade: 15, Number of Vacancy: 74, Educational Qualification and District Eligibility Please see Advertisement. Every Interest legal candidate to www.navy.mil.bd or www.bdresultjob.com at download and print their application form. Only Bangladesh Prime minister Office determinate application form can apply otherwise application will not accept. 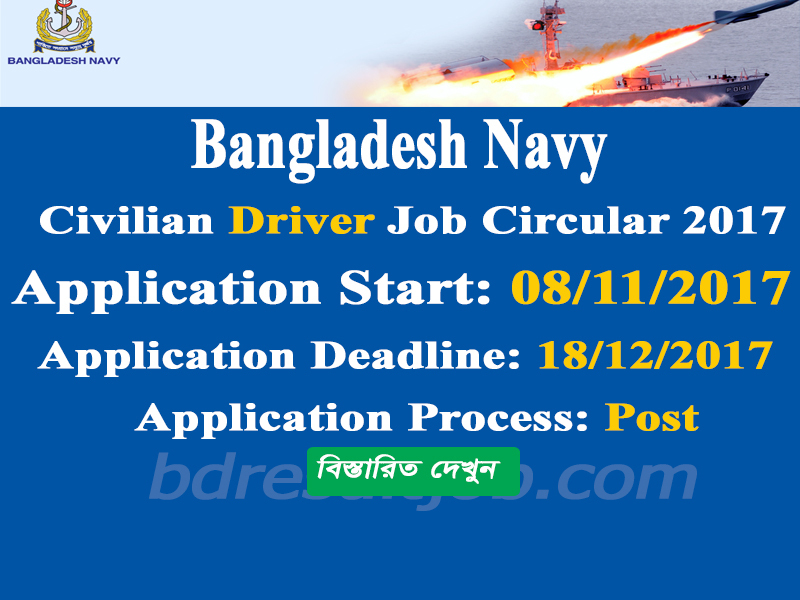 Tags: www.navy.mil.bd, www navy mil bd, Bangladesh Navy Civilian driver circular 2017, join Bangladesh navy, bd navy job circular 2017, www Civilian navy com bd, Navy Circular 2017, navy job circular 2017, Bangladesh Navy Civilian circular 2017, join bd navy, bangladesh navy driver job circular 2018, Navy driver job circular 2017, Bangladesh Navy Civilian driver job circular 2017, join Bangladesh navy 2017, bd navy driver circular 2017.